The paper discusses the morphology, anatomy, and geochemistry of zircons from granitic rocks of postorogenic intrusive series with Li-F granites in the Russian Far East. The multiphase Upper Urmi pluton in the Amur region and the Severny pluton in the Chukchi Peninsula have been chosen as reference objects. 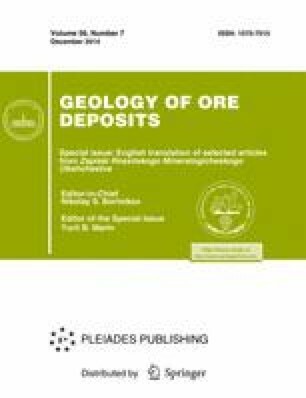 The directed variations of zircon morphology and geochemistry in the history of Pacific postorogenic granitic magmatism reflect decrease in depth of magma generation and crystallization temperature along with an increase in alkalinity, fluid saturation, and rare-metal potential of granitic melts. Original Russian Text © V.I. Alekseev, E.V. Polyakova, M.M. Machevariani, Yu.B. Marin, 2013, published in Zapiski Rossiiskogo Mineralogicheskogo Obshchestva, 2013, No. 3, pp. 1–27.